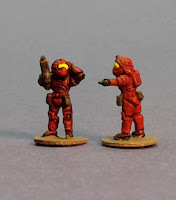 Here are my cheap SF skirmish rules. 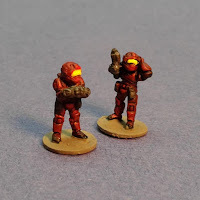 Some of these ideas I may transport back to my Afghanistan skirmish rules. Apologies for the wonky formatting, I'm just copy and pasting from a Word .doc and had to reformat some stuff that was in text boxes. But it's FREE so quit your griping ya apes! Light Vac Suits- worn by ships crew, civilians, survey teams etc. Use one coloured chit for each fireteam or vehicle. Red one side, black the other. 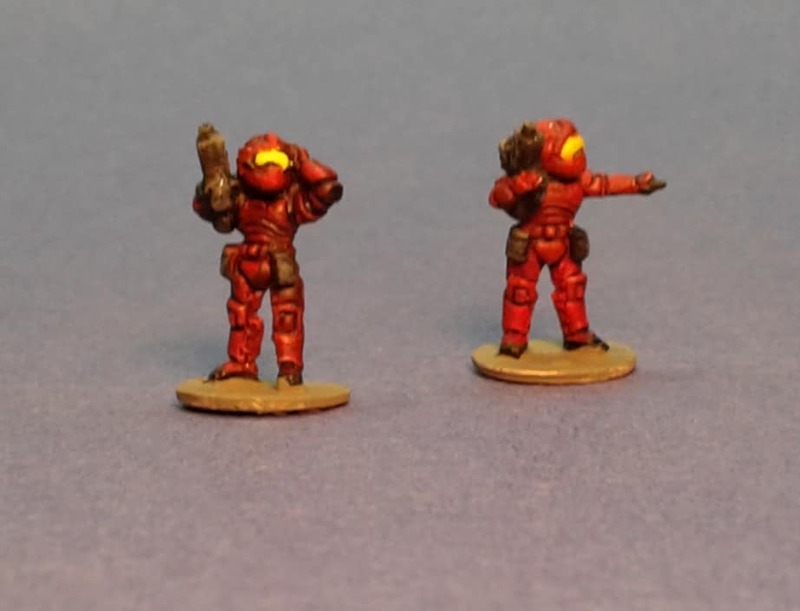 Or for larger multi sided games use each suit for different factions. Add a third coloured chit for Random Events. 1- Passing craft overhead. Next unit to activate cannot move. 2- Meteor strike! 4d6” and scatter dice from center of table. Any team within 3” of impact gets AP 5 attack. 4- Crevasse! 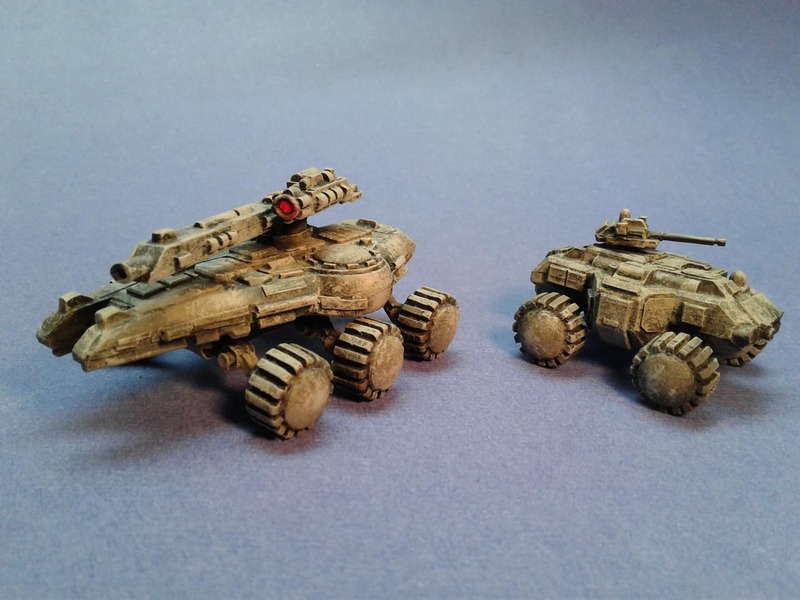 The last ground vehicle that moved must test. On a 4+ it is stuck in a crack in the surface and can’t move for rest of game. 6- Cyber-attack Next unit drawn cannot move or shoot. Place chit with team/vehicle to show it has activated. Be sensible. Ground vehicles aren't going to be crashing through rocks mounds or crossing crevasses. That's what the engineers are for. Low Gravity Troops on foot moving fast can bounce over obstacles add +1 to an enemy spotting roll. But they can also try and spot over any LOS blocking obstacles. Any weapon with an AP factor reduces the Armour save by that amount. No move and shoot. D6” move. When a figure moves into contact resolve hand to hand. Each figure rolls a dice. High roll wins. Loser moves away fast move. If player declares before rolling attempt to capture then loser is captured. High roll doubles loser, then loser dead. Vehicle gets Armour Save based on Armour Value of facing hit minus AP value of weapon attacking. A 6 on an Armour Save roll is always a save. If the Saving Roll is failed then roll for effect. 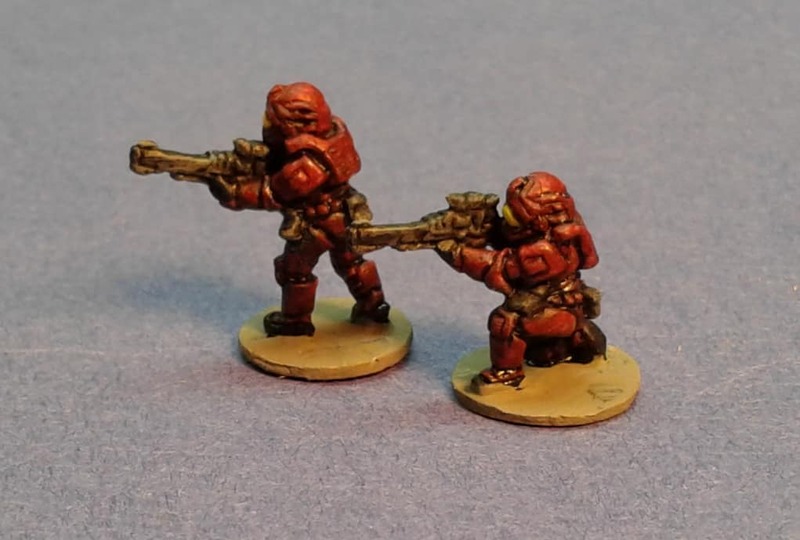 I have finished the additions to my Martian Marines. The command pack features some fellows with monoculars and a tablet type control pad, plus this alarmed looking fellow holding his helmet. I just find him amusing and characterful, which is pretty good for someone in a full helmet. 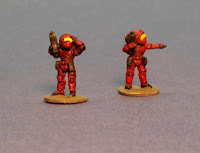 The monocular users will either be in the HQ teams or assigned as spotters for the snipers and missile launchers. 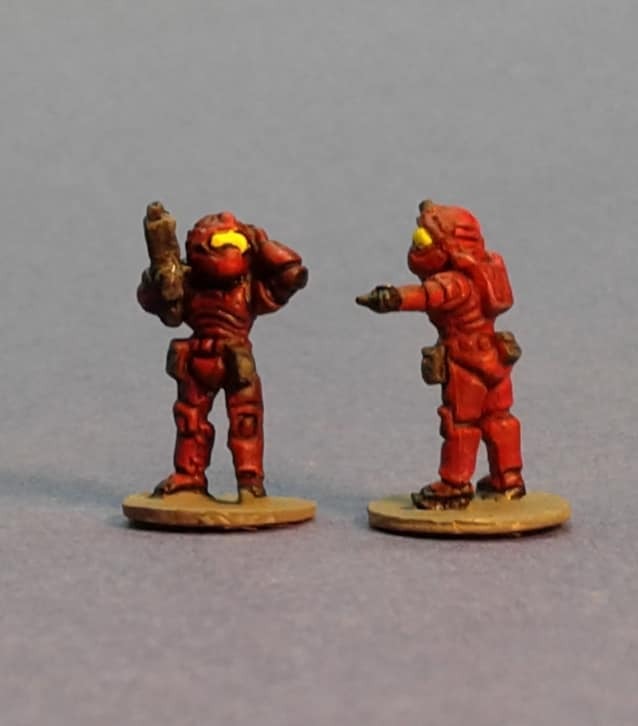 "Look over there sir!" "Ack!" 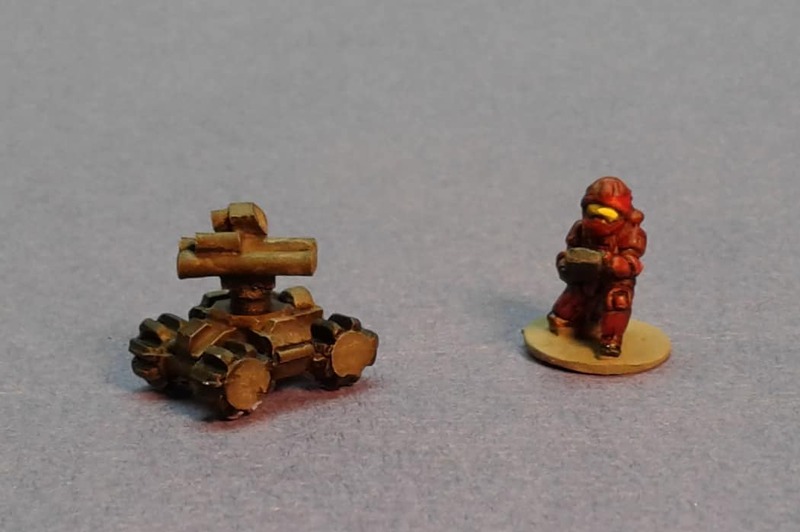 "You won't believe what 2 platoon is doing sir"
For heavy support I also got some missile bots to supplement the gun bots. I figure these will be used for defensive missions rather being dropped from a ship. Then there is some shoulder launched missile support too, for drop insertions. 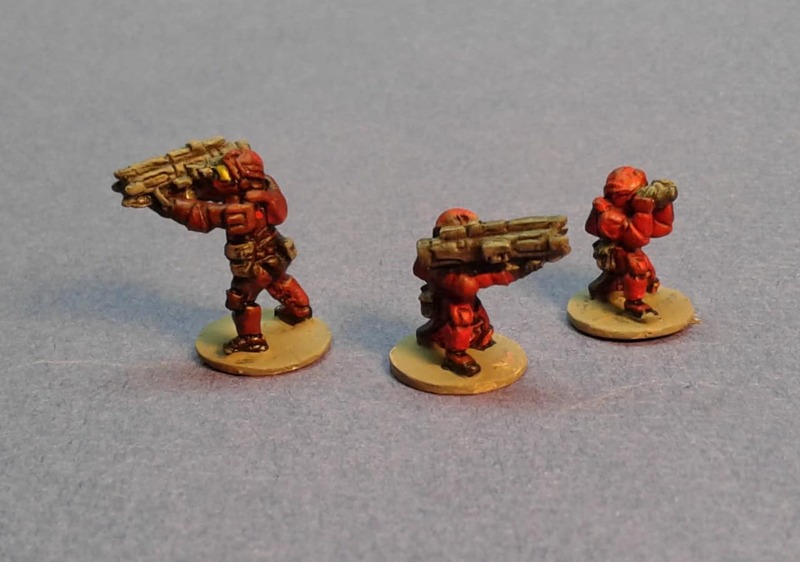 The pack of 4 missile launchers also included 4 snipers. 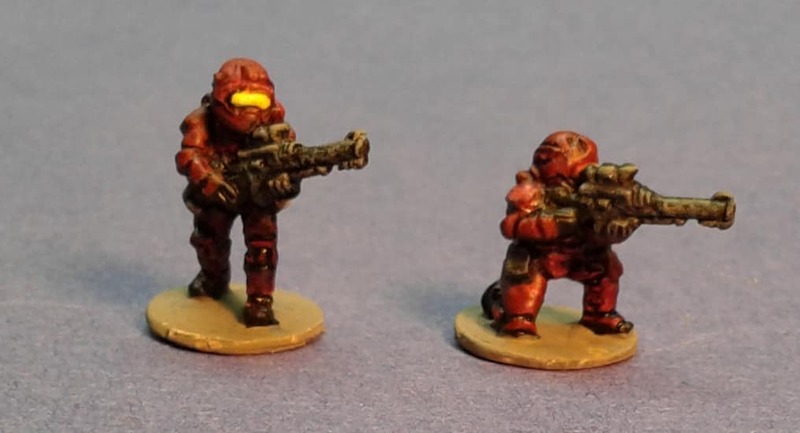 I thought about putting these guys in some dark grey camo, but decided against. With sensors etc. they could just as well be in bright pink so long as they aren't radiating any energy signal. 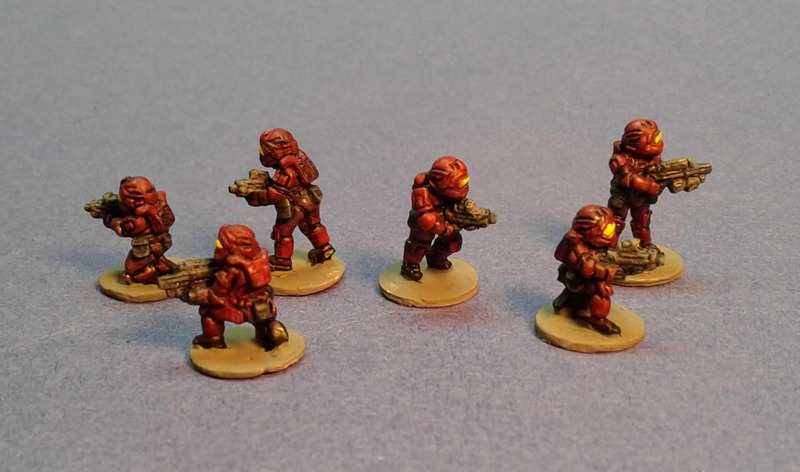 I also added four more 3 man fireteams to make two platoons of 6 fire teams plus HQ and weapons teams each. I have 4 left over SAW/LMG types who I will probably assign to the sniper and missile teams as close protection. 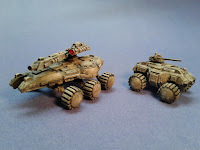 And a better picture of the tanks. Note the red dot laser projector to distractify the Mad Padre's Space Kitties. Still debating tactical markings. So that's it for space marine types. Now it's just angry colonist/pirate/smuggler types for unsuited mayhem inside the tunnels of an asteroid/moon colony or on a distant world through the ring gates.